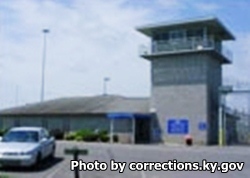 Western Kentucky Correctional Complex is located in Fredonia Kentucky, part of Lyon County. It is a medium and minimum custody prison that can house up to 693 female inmates. One of the more unique aspects of this institution is that it manages a farm. The farm consists of cattle, 800 acres of crops, an apple orchard, and a large composting operation. The farm helps generate hundreds of thousands of dollars each year. Selected minimum security inmates also provide supervised services to the surrounding communities. Offenders at Western Kentucky Correctional Complex can also participate in substance abuse treatment programs including alcoholics and narcotics anonymous. Programs for anger management, parenting and general life skills courses are also available. Visitation days are alternated between the minimum security unit and the compound. Visiting is conducted on Saturdays, Sundays and state designated holidays from 7:30am-2pm. Registration for visiting is from 7:30am-10:30am, if you arrive after 10:30am you will not be allowed to visit. No visitors will be allowed to leave between 1pm and 2pm. The visitation schedule is rotated quarterly so you should always call to confirm the day before your visit to ensure it is still current.